As the largest land mammal, it makes sense that it would take elephants years to reach full growth. Reaching their final height usually occurs around the end of their adolescence, but they don't always start trying to mate as soon as they're grown. Some males are well into their 30s before reaching that milestone. Elephants take a long time to grow physically and emotionally. They reach the majority of their sze by age 15, but often continue to grow in size and weight until they're about 20 years old. Males might fill out for a bit longer, but by age 25, both males and females are at their full size and strength. Females reach sexual maturity before their bodies have finished growing. Some females are able to reproduce as young as age 9, but most are between 12 and 16 when they reach sexual maturity. They can have a calf every three to five years until they are in their 40s, but most female elephants have no more than four babies during their lifetimes. Older females usually manage the herd, keeping younger elephants in line and teaching them how to live like an elephant. Male elephants usually reach their sexual maturity around age 10, but they aren't fully grown physically at that age. This means a young male must wait until he's strong enough and smart enough to compete against other males for a female's affections. Most males don't mate until about age 30, if at all. They can continue to mate until they're old enough to lose to the younger guys, which is often well into their 40s. Elephants can live nearly as long as humans. In the wild, elephants might live anywhere from 30 to 50 years, with lucky ones sometimes hitting 70. In captivity, an elephant can live as long as 80 years. 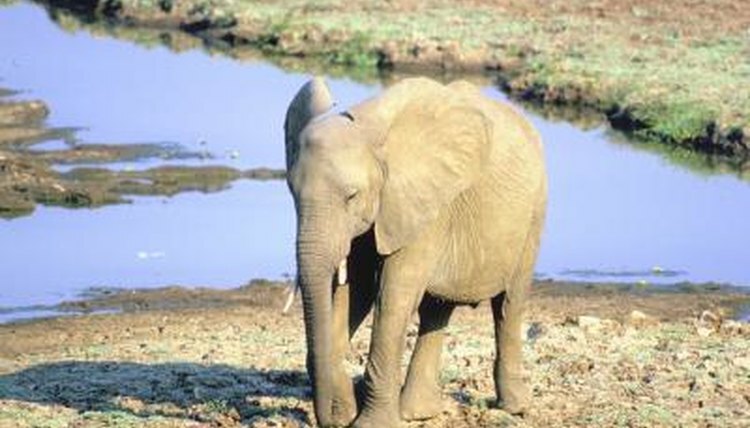 After an elephant hits 50, he starts to decline a bit physically, sometimes suffering from problems such as arthritis. Elephants lose their teeth several times during their lifetimes; they can grow back their molars six times, usually. When they can no longer replace their molars, the elephants die. How to Tell if a Newborn Kitten Is in Distress? What Is the Little Part on a Giraffe's Head?